In this study, I looked at the experiences of survivors of sexual violence among the overall refugee population in Uganda and how the issue of sexual violence against men during conflict can become more visible, given stigmatization of male survivors of sexual violence by public opinion and the media. This study aims at exploring how stigmatization and categorization of refugee male survivors of sexual violence as homosexuals has made them invisible when it comes to accessing medical care and services in Uganda. 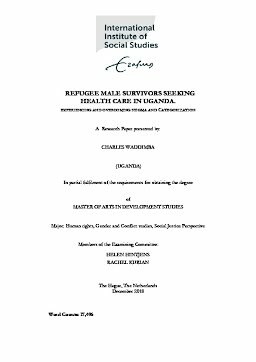 By exploring experiences of refugee male survivors of sexual violence before, during and after accessing medical and health services in Uganda, the study seeks to make more visible how the stigmatization of male survivors of sexual violence by public opinion and medical personnel affects these survivors. By interviewing thirty individuals, including some 20 refugee men, and around 10 services providers NGO staff, and ministry officials, this study confirms that cultural stigma and categorization affect the services provided to male survivors of sexual violence in Uganda. These factors play a significant role in making it harder for refugee men who have survived sexual violence to obtain adequate medical and health care. In conclusion, the findings of this research lead to a number of recommendations as to how refugee male survivors of sexual violence could be better supported in future to obtain the medical and psycho-social services they so urgently need and deserve.